The next update of Diving Log will also contain the ability to synchronize logbooks across multiple Windows PC’s, Mac’s and Smartphones using the new Dropbox sync function. Dropbox is a very popular, free and multi-platform online storage and sync service. Once you’ve installed the Dropbox client on all your PC’s and Mac’s you can exchange easily any file between your computers by simply coping the file into the special Dropbox folder on your disk. Note: The Dropbox client application has to be installed on the PC to use this sync function! 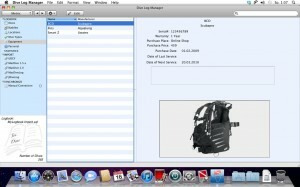 But Diving Log does not simply copy your desktop logbook file, because the Access database format is not really platform independent and could not be read on the Mac or on smartphones. The new Dropbox sync will export your logbook into the SQLite format and also import any changes from other computers back into your logbook. The sync function can manage different logbook files and also additional information like the last sync date and time and from which computer the logbook was last updated. I will add support for Dropbox sync in future to the Windows Phone 7 version, so you can seamlessly exchange logbook data between any device running WP7, Windows or Mac OS. 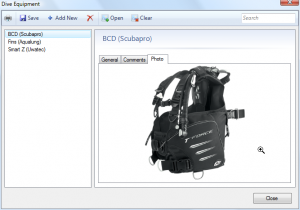 This feature provides you additionally an online backup system, so you can easily get your dives back when your hard drive crashed. I often get requests for a Mac OS version of Diving Log, either from users who have switched from Windows to Mac, or from users who have both (e.g. a Windows PC and a MacBook). 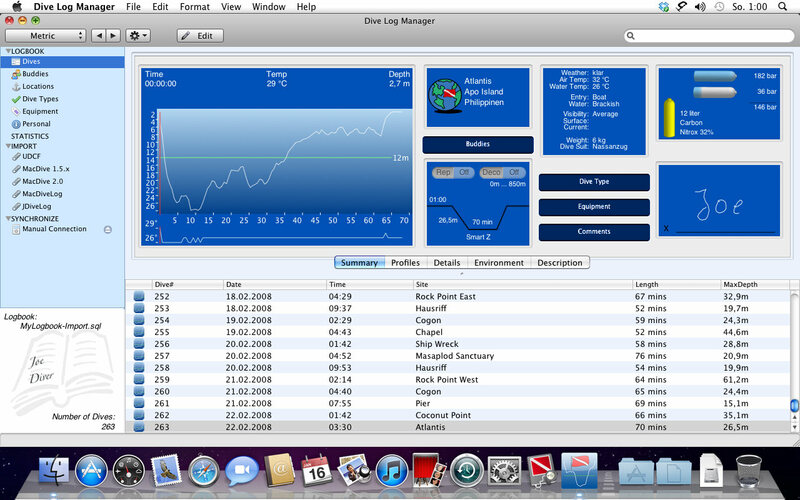 Even though I don’t have enough time to create a Mac version myself, luckily the wait is over for all Mac users out there: you can now use the Dive Log Manager application for Mac OS to view and edit your Diving Log logbook files on your Mac! Dive Log Manager has started 2 years ago as a small desktop sync tool which enabled iPhone users to sync their logbook to the Mac. But it has grown over time to a full featured desktop dive log for the Mac, and with the update from last December it has now also editing capabilities. 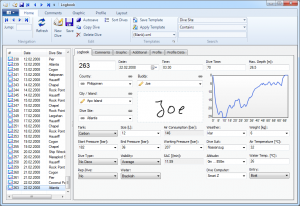 It is available in two versions: a free version which can view logbook files without limitation and a paid version which contains the editing features. Both versions are also available in the new Mac App Store. 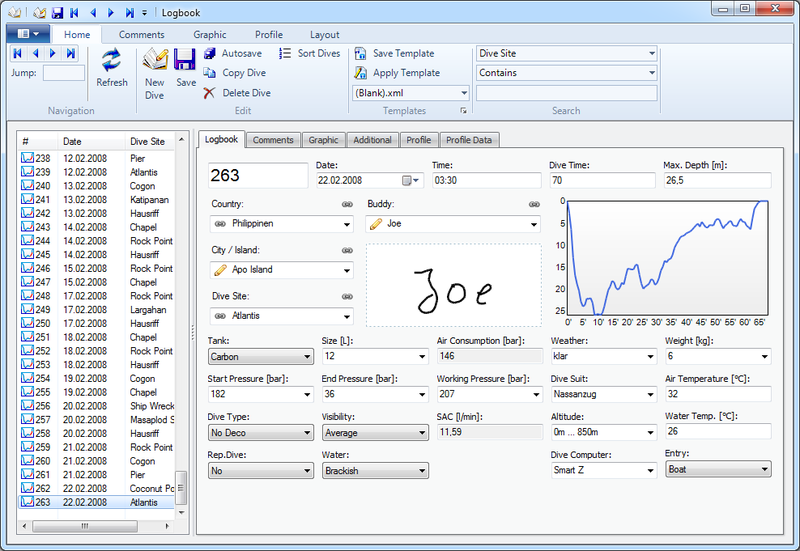 The logbook format is the same used by Diving Log on Windows (and iPhone), even though it is a SQLite database instead of an Access database. Diving Log 5.0 can export to that format (using the SQLite export) and, with the next update, also import the Mac logbook back into Diving Log 5.0 using the “Dive Log Manager” import function. And it’s getting even easier to exchange data between Windows and Mac OS: You can sync soon your logbook data seamlessly across different Windows PC’s and Mac’s via the new Dropbox sync (more about that in my next blog post).